If you thought a comet that contains the building blocks of life and creates its own weather couldn’t get any more interesting, think again. Scientists finally have a theory as to why comet 67P—also known as Rosetta’s comet—has two distinct lobes. It’s actually two distinct comets, which break up, orbit one another, and smash together again and again for all of cometary eternity. And despite how strange this relationship sounds, it may be a lot more common than we thought. That’s according to a new modeling study of comet evolution conducted by researchers at Purdue and the University of Colorado Boulder. The study, which appears today in Nature, was inspired by the observation that the “neck” connecting comet 67P’s two lobes features two large cracks, each longer than the length of a football field. On seeing those cracks in the first high-resolution images acquired by the Rosetta spacecraft in August 2014, Masatoshi Hirabayashi and Daniel Scheeres immediately realized they could be looking at the traces of a violent history. To simulate the evolution of comet 67P, the researchers modeled 1,000 comet “clones” under varying conditions over the course of 5,000 years—the expected lifetime of a so-called “Jupiter-family comet.” In some of these models, the comet’s spin rate was cranked up from one rotation every 12 hours to one rotation every 7 to 9 hours. And something very interesting happened: the comet started cracking up. “Our spin analysis predicted exactly where these cracks would form,” Scheeres noted in a statement. 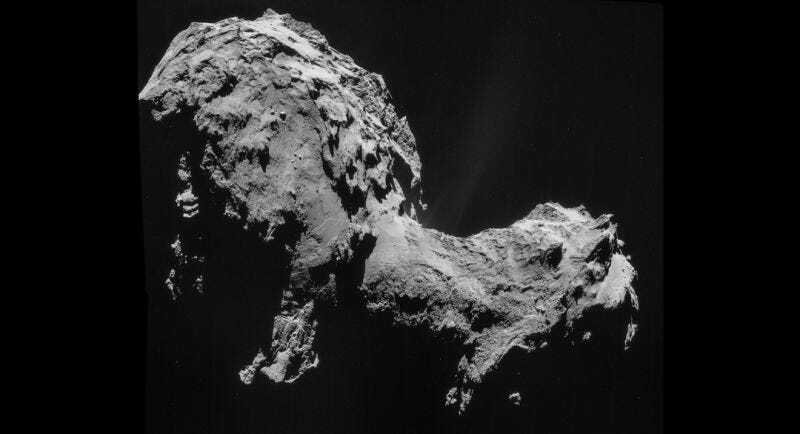 When the spin rate for a comet 67P lookalike was increased to less than 7 hours, the comet’s head popped clean off. But it didn’t slingshot away—instead, it remained gravitationally tethered to its other half. Scheeres and Hirabayashi’s models show the two halves orbiting one another and, after a period of hours to weeks, coalescing in a new configuration. It’s possible that this process of breakup and rearrangement has happened throughout the lifetime of comet 67P, and that it may be a common feature of “bilobed” comets in general. While it’s not yet clear how often breakup should occur, the researchers note that periodic comets are regularly torqued by the gravity the sun and Jupiter as they traverse our solar system. This can cause them to spin up or down. Spin rate can also be influenced by outgassing, or the sublimation of volatile ices that causes a comet to lose mass over time. The team now plans to study other imaged comets in more detail, to see if they could be subject to similar forces. If bilobed comets, like 67P and Halley’s comet, turn out to be cosmically common, it’s possible our solar system is full of shapeshifting space rocks that are far more dynamic than they seem. Clearly, with comets as with planets, a few good photos doesn’t tell the whole story.